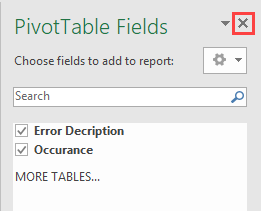 After you create a pivot table, you can accidentally close field list. If you click the pivot table it won’t appear. It’s easy to make it appear again. If you want to have it back, follow these steps. Click inside the pivot table. Now, the field list is on the right side, as it was before. In this method, you can show Field List by right-clicking the pivot table and choosing Show Field List option. When the Field List is present, you can turn it off, the same way, but this time by choosing Hide Field List. There is another way to do it if you want to access this option with a keyboard shortcut. Click pivot table and press the following buttons – one after another. It will turn on the Field List button. Do it again and it will turn it off.